I've done a lot of crazy, adventurous and dangerous activities in my life but the scariest so far has been public speaking. I absolutely hate it. Presenting in classes throughout school into college was a nightmare and I remember shaking uncontrollably before my turn every time. Nowadays, speaking in front of cameras is a task that feels equivalent to jumping into a pit of snakes for me. That's why Cerevrum's Speech Center VR app is so intriguing to me. There are plenty of apps for the Samsung Gear VR and Oculus Rift is slowly building up a repertoire I can barely keep up with. But there aren't a lot of educational apps, or I should say, potentially successful education apps that keep you coming back for more. Speech Center VR has the potential to be a valuable new addition. It launched in alpha last January but now it's ready for prime time - or at least it mostly is. COO Olga Peshé says it will start out with speech courses that will focus on networking skills, effective selling and negotiations for the work space and even dating. From there, the platform could grow to encompass even more subjects. "We decided to focus on teaching people effective communication first because it's important in both business and daily life but they don't really teach it in school or get to practice it. "Then if we really see interest, and if they're excited to learn in VR, we'll scale up to teach any discipline we can." Peshé notes that it simply made sense to start out with communication and create an educational platform because they've both been long lasting interests to the team. "We released several demos with Speech Center but at the time they were just public speaking simulators where you can better prepare for any speech," she told us. "After winning the Oculus Jam in 2015, we found an investor who was a regional co-founder of Oculus and with his financial support and advice, we decided to continue working with corporate clients but we launched products of our own both focused on education." One was a brain training game, which yielded fascinating results when used to test memory skills with college students. Those who played the Cerevrum brain training game in VR scored higher in a memory test versus the college students who played on a tablet. The data was presented at a gaming conference to show that VR for learning was actually validated. Though it was just one test, it solidified the path Cerevrum was already on where Peshé says, "From there we decided to keep pushing forward with education." We turned our attention back to Speech Center VR where it transformed from a simulation into a full-scale educational platform." At the moment, there are two formats of Speech Center VR. One is for self-learning where 16 courses will be available and you can take them on your own time. The second format is more experimental where a professor (or professional in the field) will give real time lectures in VR through an avatar. The first one called 'The Art of Public Speaking' starts in September and will run a month with two classes a week where each lecture can host up to 1,000 people simultaneously. It's not just sitting and listening either. You'll get to participate in a Q&A session at the end of lectures, and do group work where you practice with people in VR. Broken down, it will be 10 minutes of lecture time, a 10 minute break, then 15 minutes for group work. If it sounds short, Peshé says that's about the average length people can stick around in VR. Though again, this first class is experimental and things can change with the next course. This concept isn't entirely new considering what AltSpaceVR, Project Sansar and others are trying to do. 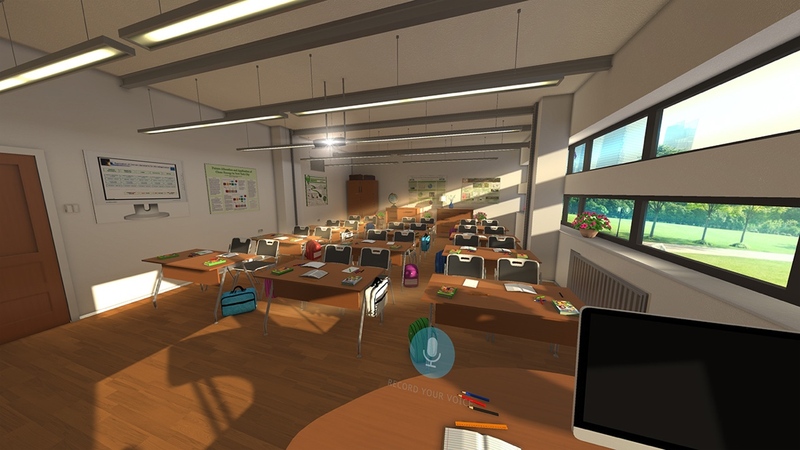 But the Speech Center VR platform is more focused on education and it's starting out with one subject people can learn rather than trying to throw tons of options in your face. Within the platform, you can socialize in different spaces (17 virtual environments to be exact) with moderators ensuring your group work is progressing and that you're getting feedback. Or you can choose to go your own way and test yourself by uploading your own presentations in PDF format (with 10 environments). Avatars can also be customized with over 50,000 different variations, and later on, Peshé says they will turn to face the person speaking automatically which should help it feel less disjointed. Trying it out for myself on the Gear VR was pretty nerve wracking with Peshé sitting in front of me. The default presentation was talking about my favorite place in San Francisco. After nervously asking 10 questions about what I should mention (it was a simple exercise, but my brain muddled it up because of the 'public speaking' aspect), I loosened up and was able to talk about the Mission, my favorite SF neighborhood. I also tried a bit of the self-learning portion which was elegantly created with fun animations, multiple choice quizzes and pacing that kept me invested. With more time spent doing the entirety of the course, I wondered if I'd be able to conquer my fear. Peshé is especially excited about being part of the first, if not one of the first, to pioneer a way forward with an educational platform in VR - something that was once only imagined up in fictional worlds. Ideas for a few other subjects have already been tossed around and even tested with kids in school. "We did some seven minute experiences with physics, like when you're inside the electrical chain, you will see the atoms but you're actually inside them. We even went to schools to show kids and asked, 'Would you be excited to have this as part of your curriculum?' We asked what subjects they'd want to learn more about in VR and the top answers were physics, biology, chemistry and history. "The kids loved it so we'll be figuring out how to turn the Speech Center platform into a bigger educational platform. But for the moment it will just be communication." Businesses will also be able to capitalize on Speech Center's offerings for educational purposes as well. Companies can use it as a platform for teaching employees, improving internal communications, sales pitches, negotiations, press conferences, job interviews and more. Presentations can be recorded and stored with voiceover in one accessible database. Employees can then access them, listen to the recordings while watching the slides and comment on them. Recordings can be shared - or remain private - for others to watch and learn from as well. While the app is free for individuals, the business package will cost. However, there will be some in-app purchases for certain courses, including the one focused around speaking during dates. This should be an interesting experiment to keep an eye on as we're sure to see more and more VR classroom apps pop up, especially if Cerevrum comes away with happy students. Speech Center VR is available to download now from the Oculus Store for free.